As we await next year’s ‘proper’ Fire Emblem entry on Switch, strategy and tactics fans have several alternatives in that nebula of sub-genres to tide them over. Between games like Mercenaries Saga Chronicles, Disgaea 5 Complete and The Banner Saga trilogy (or even Mario + Rabbids, genre police permitting), it’s easy to while away hundreds of hours locked in turn-based combat. 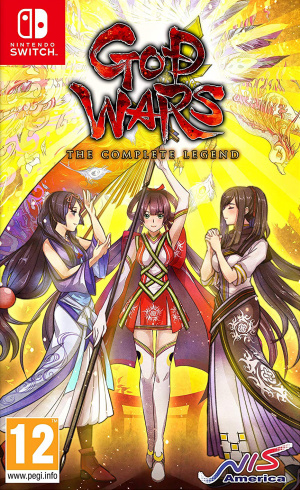 Joining those ranks is an expanded port of God Wars: Future Past, now rechristened God Wars: The Complete Legend. Released last year on PS4 and Vita, this includes the original game and its updates, plus the Labyrinth of Yomi expansion. It certainly represents excellent playtime-per-pound value, but it’s one hell of a formulaic legend. Developer Kadokawa Games weaves elements of Japanese history and myth into its story of fated princesses, capricious gods, magical mirrors and myriad other elements of the RPG canon. Benevolent Queen Tsukuyomi of Fuji sacrifices one of her daughters to appease the restless gods and usher in an era of peace. Thirteen years later, another of her daughters, Princess Kaguya, begins an intrepid quest to find her missing mother at the behest of a mysterious voice. Along the way, new friends join her cause giving you a large roster of combatants to choose from. The epic story plays out in comic book montages and dialogue between (or sometimes during) battles, and fans of glistening eyeballs, inappropriate costumes and shocked gasps are in for a treat. Japanese and English voiceovers are available, and both are suitably melodramatic with grunts and sighs aplenty, plus that unique sound young warriors emit when they goof in the presence of a fair maiden. Unfortunately, the voice actors are working with some real drivel – a plague of proper nouns. No character may speak without using another’s full title; the endless barrage of nouns is completely unnecessary and a massive drag. Grammatically, it’s perfect but it’s mind-numbingly repetitive. Skipping it all is, thankfully, an option but after some terrific localisations in recent years (8-4’s sterling work on Fire Emblem Awakening being the gold standard), God Wars feels like a step back into the dark days of the ‘90s. Fortunately, its turn-based combat is solid fare. Battles play out on floating chunks of terrain with the familiar grid arrangement. Assemble a party to your liking (within the prescribed restrictions) and work your way across the board to meet the win condition (usually to eliminate all enemies or a boss). 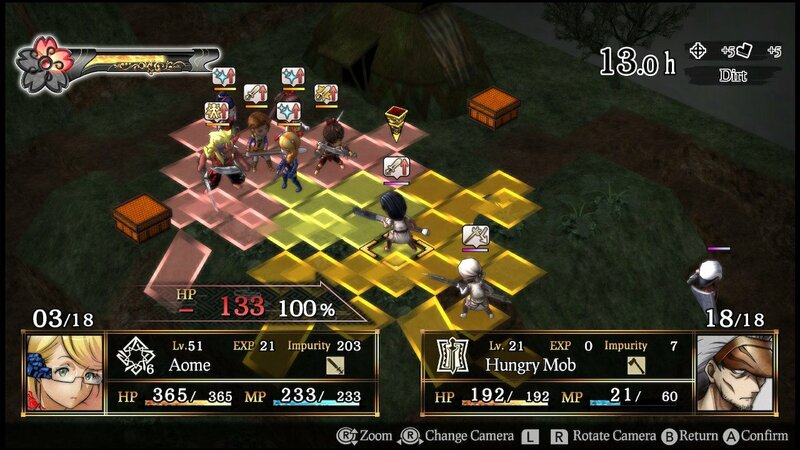 Anybody familiar with the Fire Emblem SRPG template will quickly feel at home, although it’s not quite as user-friendly. Everything works fine and the UI is clear, but a few too many inputs are required every turn. 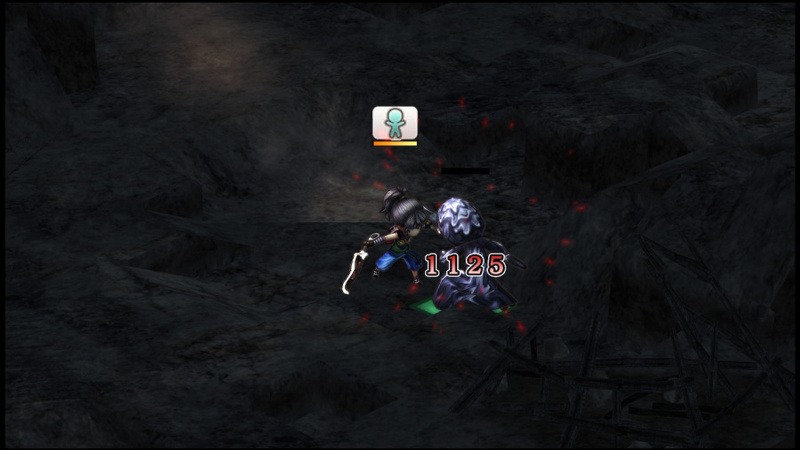 Manually selecting enemies rather than snapping between them is an inconvenience that becomes a chore after dozens of hours. AI control is available for any or all of your party – handy if you want a healer working the board while you concentrate on the nitty-gritty of combat. Alternatively, you can leave stronger characters to grind on a lower-levelled sub-quest while you go and make a cup of tea. Visiting Shrines along the route enables you to accept requests or make offerings and worship to gain stat boosts for the following battle. Terrain elevation plays an important role and affects the damage taken and dealt – higher ground always gives the statistical advantage. At the end of your turn, you choose the direction your character faces, adding another layer of strategy. The default view is isometric-style and, although the camera height is fixed, the right stick rotates in 45° increments and zooms. Navigation is imprecise with a stick in the diagonal view – a ‘side-on’ angle of the board offers easier movement. You’ll need to rotate when terrain obscures the fight but making out characters from background detail can still be a challenge, especially when groups clump together. You appreciate just how well the Fire Emblem series makes these complex battles readable. Combat options include vanilla ‘Attacks’ and MP-draining ‘Skills’ which include offensive/restorative moves and (de)buffs. 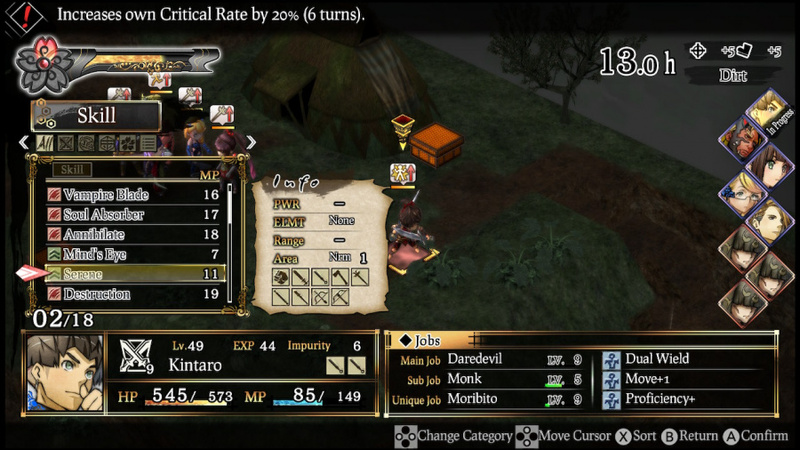 Main and sub jobs are assigned, plus a unique job for each party member. Job Points (JP) are earned through battle and enable you to unlock new skills and passive abilities, plus secret skills which affect the entire battlefield and are locked to a meter that builds from party-wide actions. Then, of course, there’s an Equipment menu with six slots per character for weapons and armour found on the battlefield or purchased from merchants on the trail. A ‘recommended’ button optimises each character’s gear if you don’t fancy getting into the weeds. On the presentation side of things, menus have a logical layout and the dialogue text – though frequently banal – is large and readable. The anime character portraits look excellent, with thick inky outlines and colourful designs, while character models in battle are smaller, chubbier versions which echo the designs in any number of RPGs. The movement animation is somewhat primitive, though, especially in the interstitial scenes just before or after battle – characters jerkily fall off ledges as they negotiate the terrain. The maps themselves are a mixed bag, too. Textures are bland and the blocky battlegrounds seem to lack shadow or ambient occlusion. A particularly unimpressive encounter involving two wooden boats in chapter two would have looked ugly even on the Nintendo DS. 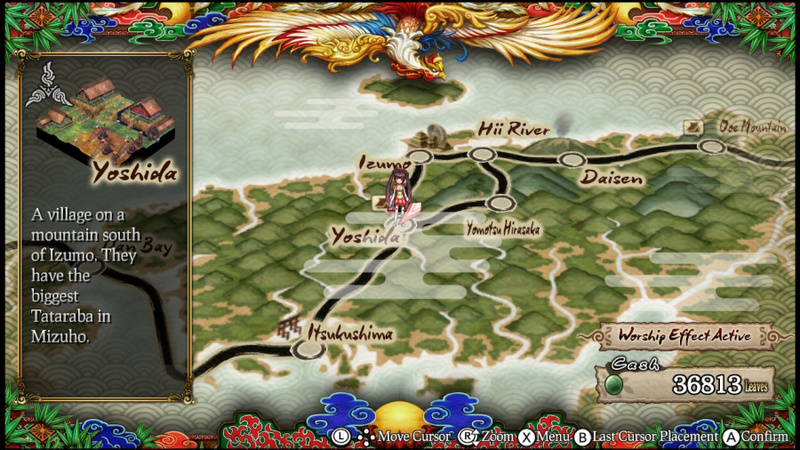 Off the battlefield, the overworld and UI are more attractive, although it’s unfortunate that this releases so close to the Okami HD port. Both games draw upon Japan’s rich art history and some of the same mythology, but Clover’s now 12-year-old game easily trumps God Wars in terms of presentation. With a lengthy campaign, three difficulty levels, loads of class combinations, side-quests and extras, plus the expanded content, there are hundreds of hours of gameplay here – and Nintendo’s portable is as good a place as any to get stuck into it – but there’s very little to get your pulse racing. It’s absolutely competent and will scratch that strategy itch, but it’s entirely forgettable. In many ways God Wars is like a new Picross game; it’s more of the same. The Japanese folklore narrative offers a slight twist, but the script is painfully dull and repetitive. If you’re dipping your toe into the genre or only have time for one of these, we’d sit tight to see what Intelligent Systems has up its sleeve with the upcoming Fire Emblem: Three Houses. If you’re a strategy junkie after a fix, it gets the job done with all the mechanics and systems you’d expect – but nothing new or novel. Im holding out for physical copies of mercenary/banner saga & fire emblem so wont get this.. I had a feeling this was going to be a middle-of-road kind of game. I played this on PS4, and it had Japanese voice tracks, though it might have been a free DLC. Is there a Japanese VO option on the Switch version? Any glitches or crashing? I stopped playing waiting for an update to iron issues out and never went back. It's a bit better than "middle-of-the-road". It might be worth reading some reviews of the original release "God Wars: Future Past" on PS4/Vita. Every single time I read 'God of War'. I might pay 15-20 bucks for it. I dont suppose they are going to do any patches for the switch version that would iron out the technical issues? "Japanese and English voiceovers are available, and both are suitably melodramatic"
You kids, with your expectations of accuracy and effort. In my day we had spoony bards, masters of unlocking, and all your bases were belong to us--by gum we liked it just fine! Why, the word salad nonsense of FFT's tutorial was the pinnacle of training: you figured out the whole thing all by yourself, while the game taunted you with indecipherable babble. That's how real gamers do it! does it have some kind of achievement/trophy system like Disgaea for Switch, for example? how is the resolution and fps? Can you play in 1080p in Docked mode? @Spiders I haven’t experienced any glitches or crashing. @yuuji77 There’s no achievements system. The FPS and resolution are fine - I couldn’t say if it’s 1080 docked, but text and graphics are crisp. Meh, God of War is so overrated. For a second there I was going to celebrate that it's God of War for Switch and Sony loses but nope it's God Wars. Interesting how Sony let this slide despite the similar name. Anyways I may look into this one once I finish with the Disgaea trilogy, the Banner Saga trilogy, the Langrisser trilogy, the Final Fantasy Tactics trilogy, the Ogre Battle trilogy, the Mercenary Saga trilogy, the Shining Force trilogy, and the 4 Fire Emblem trilogies. Wasn't really feeling it from the promotional footage. I doubt I'll ever get around to this. I am rather bummed to hear they could take something as rich with ideas and lore as Japanese mythology and make a boring and forgettable story. What I am hearing here is that this game is just not worth the time investment. 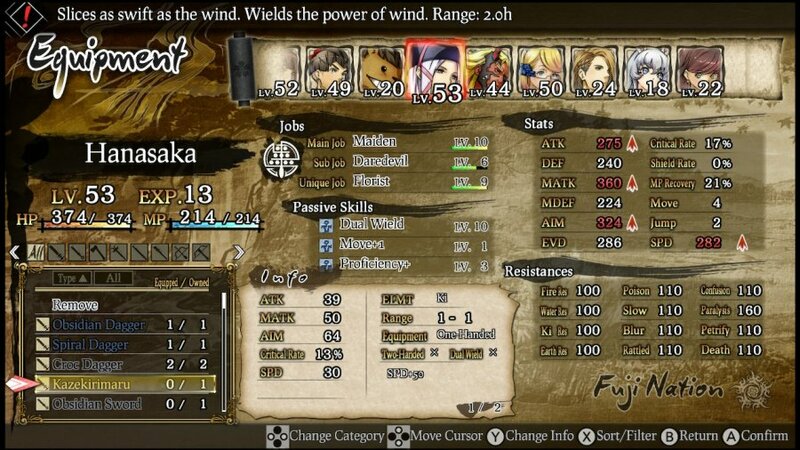 Can't be as dry as Mercenaries Saga was though. I'll wait for Disgaea 1 Complete on Switch (God I'd like a release date already!) and for Fire Emblem next year! Well, given the source content, I don't know that it's contextually correct to say the "endless barrage" of proper nouns and titles is completely unnecessary......y'know, since it is based on Japanese myths and legends.